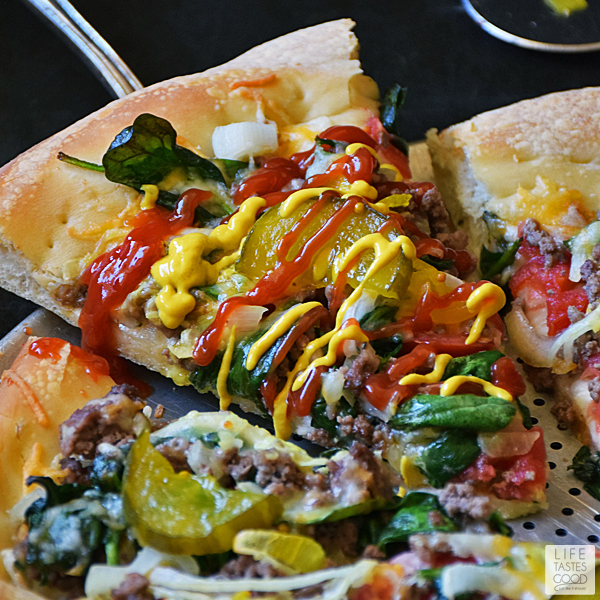 Cheeseburger Pizza takes everything I love about a big, juicy cheeseburger and plops it on top of a thick, delicious pizza crust for a tasty game day treat or a quick and easy dinner the whole family will love! This week the #SundaySupper Tastemakers are bringing you party food that is easily served to a group and eaten on laps while enjoying the big game. A big thank you goes out to our amazing host, T.R. of Gluten Free Crumbley, who made this event happen! One of our favorite foods is homemade pizza!! I love how versatile pizza is. 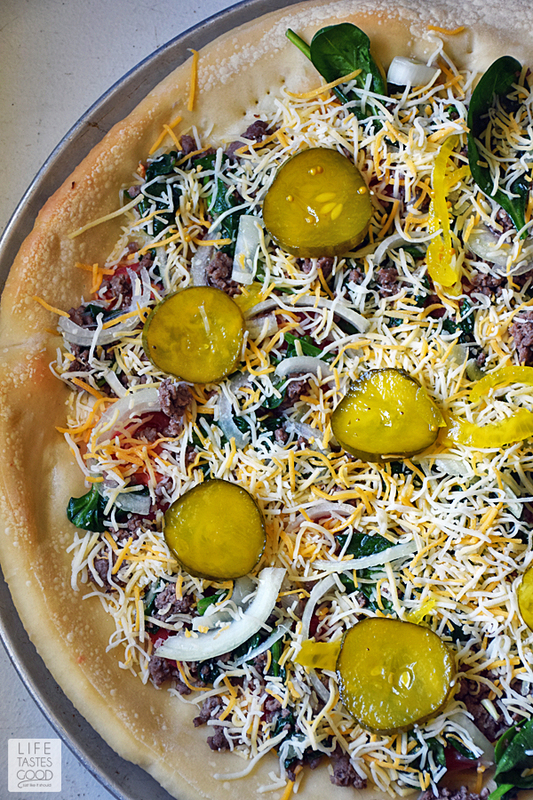 Just about anything you dream up can be put on top of a pizza. Some of our faves include Chicken Parmesan Pizza, Spinach Artichoke Pizza, and even an Eggs Benedict Breakfast Pizza! You name it! We'll make a pizza out of it <smile>. 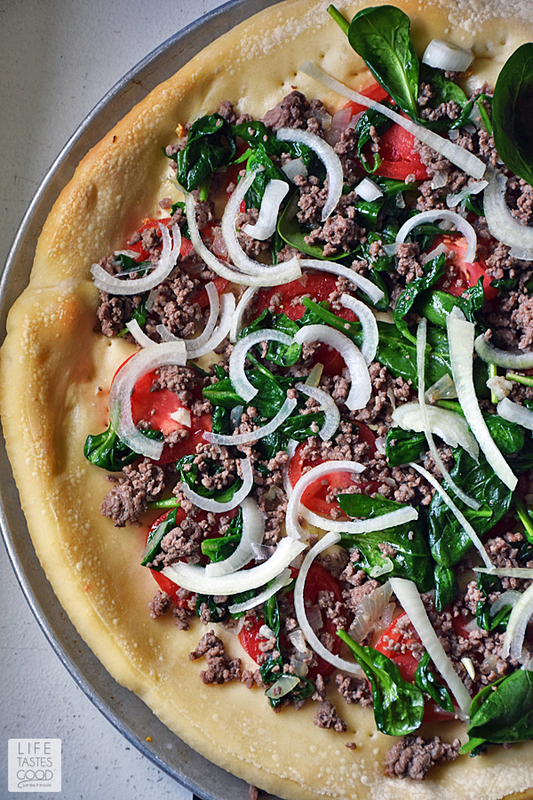 One night we were enjoying big, juicy cheeseburgers for dinner when Don said, "I bet this would be good as a pizza!" Clearly we always have pizza on our minds! 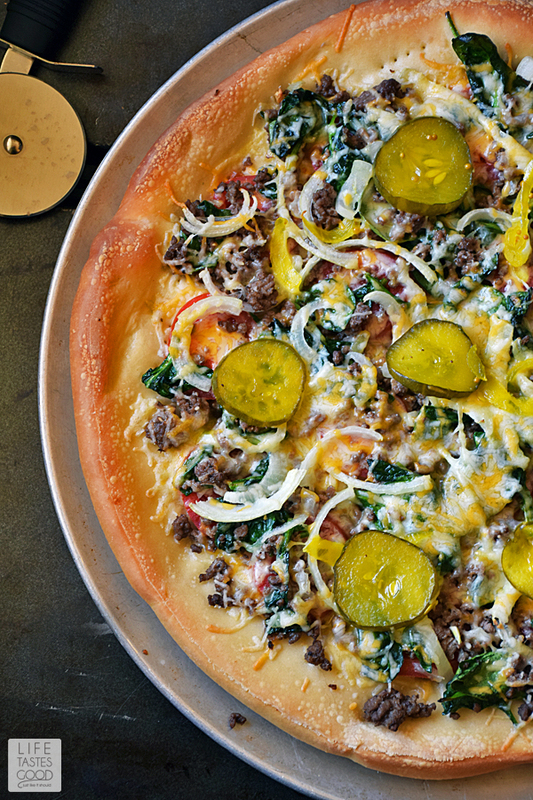 It wasn't long after, our Cheeseburger Pizza Recipe was born! 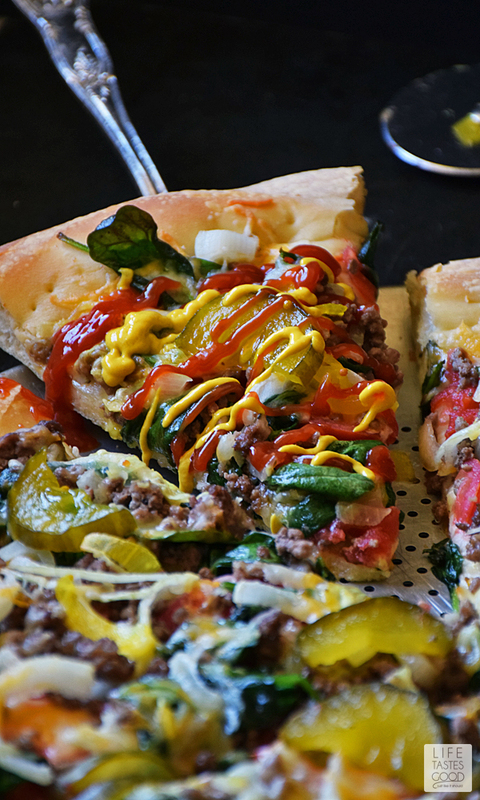 With a freshly baked crust, fresh tomatoes, fresh spinach, ground beef, onions, and yes, even homemade pickles, this pizza is quite tasty as is, but for a real cheeseburger pizza experience, I recommend squirting on some mustard and ketchup. I know that sounds weird, but it works! And if you like bacon cheeseburgers (who doesn't? ), sprinkle on some cooked bacon pieces too! 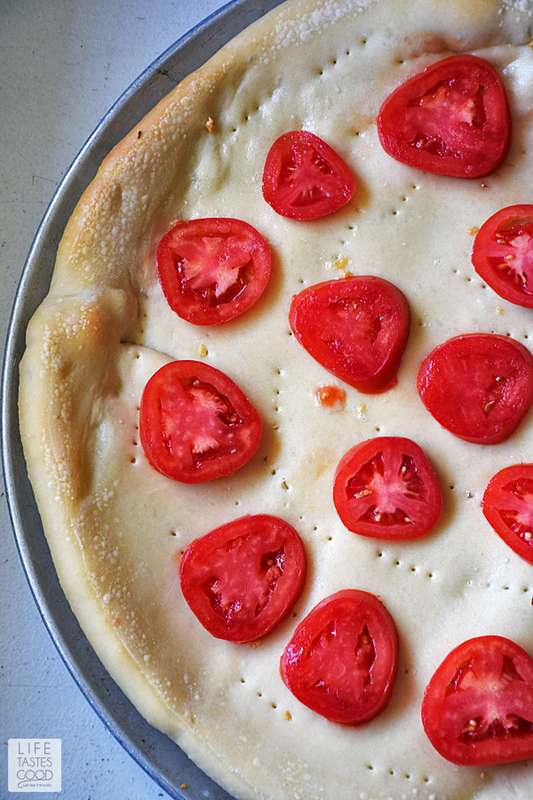 This pizza is super easy to make, especially if you have a good source for fresh pizza dough. If you have a Publix near you and haven't tried the pizza dough from the bakery, you are truly missing out! If you don't live near a Publix, try reaching out to your favorite pizza shop. Many will sell you the pizza dough to use at home. Spray a large pizza pan with cooking spray, and roll the dough out to a 16" circle. Place the dough on the pizza tray and let rise for an hour or so. When ready to make the pizza, preheat the oven to 400°F and brush the dough with garlic butter. Using a fork, poke holes all over dough. Pop it in the preheated oven for 8-10 minutes or until it is lightly toasted. While the crust is baking, heat a skillet over mid-high heat and brown 1/2 lb of ground chuck. To get a lite crust on the meat, just plop it in the pan and let it sit for about 3-4 minutes to sear. Once it has a nice sear on one side, season it with salt and pepper and break it up into little pieces. Reduce the heat to mid-low and add 1/2 cup chopped onion and 1/2 tablespoon of freshly minced garlic. Continue to break up the meat until it is cooked through and the vegetables are softened. Give it a taste and adjust the seasoning as needed. Remove from heat and add 3 ounces of spinach to the meat mixture. Stir to combine. The spinach will wilt slightly. Set aside until ready to use. Add some pickles and sprinkle on a cup of cheddar cheese or your favorite cheese blend. Place the pizza in the oven and bake for another 8-10 minutes or until the cheese is melted and the crust is baked to your liking. 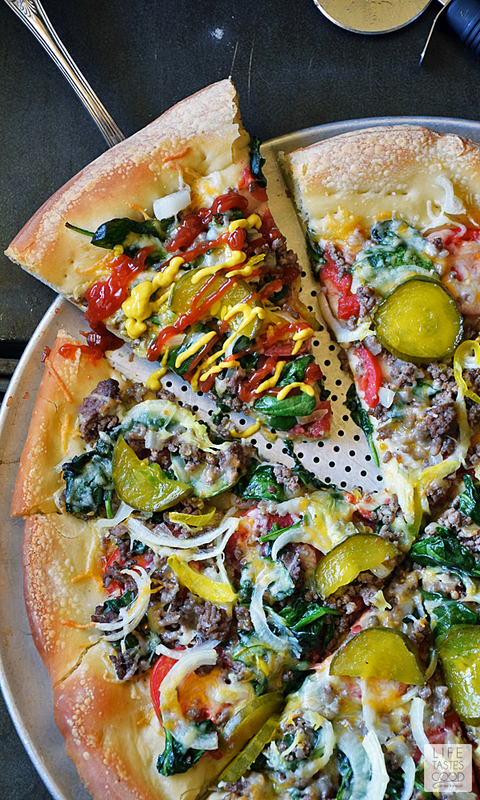 Serve this pizza with ketchup, mustard, and some napkins too. Enjoy! Spray a 16" pizza tray with cooking spray. Roll out pizza dough to 16" round and place on pizza tray. Set aside for about an hour to rise. When ready to bake crust, preheat oven to 400°F. In a small dish, combine 1 tablespoon unsalted butter with 1 teaspoon freshly minced garlic and a pinch of salt. Heat in the microwave until melted. Stir and brush on pizza dough. 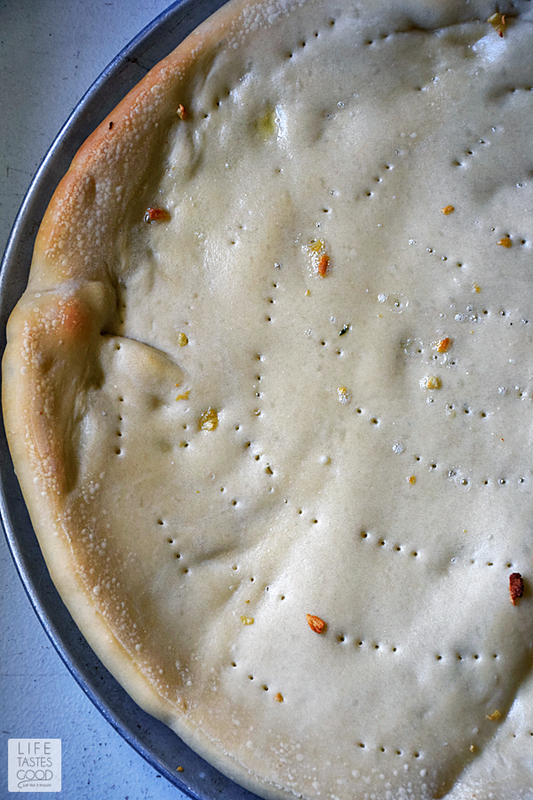 Using a fork, poke holes all over dough. Bake dough in preheated oven for 8-10 minutes until lightly toasted. Remove the skillet from the heat and add 3 ounces of fresh spinach to the meat mixture. Stir to combine. The spinach will wilt slightly. Set aside until ready to use. When the crust is slightly browned, remove it from the oven and top it with sliced tomatoes, the meat mixture, and sliced onions. Top with pickles and sprinkle on a cup of cheddar cheese or your favorite cheese blend. Yield: 1 Pizza - 16"
This FL girl didn't even think of that! Glad to help out with another cheeseburger option haha Thanks, Liz! This pizza looks crazy good! I love gourmet style pizzas! I like this!!!!!!!!!! It looks so good!!!!!!!!! Okay, you have done it again and blown me away with another magnificent dish. WOW, does that look good!! This looks amazing, and I know it is tasty with all those flavors! Great recipe! Thanks, Teri! Have a great week! I'm just going to move in with you, Marion! All of your gorgeous dishes make me hungry! LOL you crack me up! Have a super week, Nichole! Oh yum Marion this looks delicious! Thanks so much, Nora! I'm so glad you like it. I have to admit, I was a little nervous about this one as it is kind of out of the box to put pickles, ketchup, & mustard on a pizza. When my mom liked it, I knew I had to share :) Thanks for stopping by! I hope you have a super week! Love all the toppings! So colorful! This is absolutely incredible!! I love your photos, too. 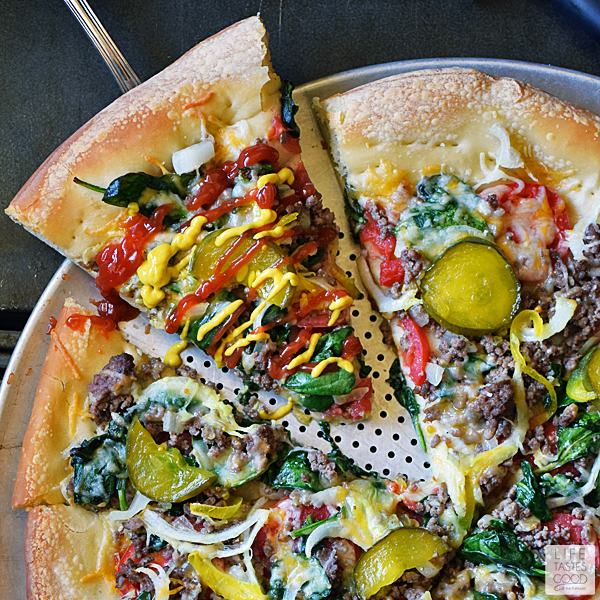 This cheeseburger pizza recipe looks really good. I can imagine that this would help solve deciding what I should feed my kids for dinner. There have been a few nights when two of my kids wanted pizza, but the other one wanted cheeseburgers. Combining the two into one recipe would help solve this issue by giving all three of my kids what they want when they can't decide whether they want pizza or burgers. Love this idea for pizza! Great for when yoou can't decide! Oh, Can I have a slice?